The capacity to express oneself with so much strength that you wonder where the train that just ran over you came from. It’s an intimate moment filled and empowered by a long searched catharsis to scare our demons away. Piano based songs with dynamite in their words and passionate intensity in the vocal duties, you can almost feel the pain of every syllable she sings. 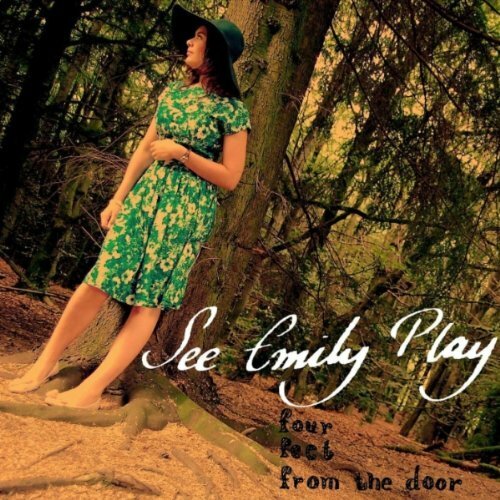 Under the stage name of See Emily Play, Emily Ireland presents her debut EP called Four Feet From The Floor, a powerful delivery of 5 tracks of various styles going from rock, pop and even some ska-ish sounds, including as well the one that seems her core style: piano-based. All of the songs are permeated with the technical perfection expected from a trained musician, where the piano is the perfect metronome to the band that is incorporated throughout the EP; however, the piano is played here with unique intensity as it may seem to become the heart of her, implying the capacity to exorcize whatever is hurting her from the inside. The best example of this intensity comes in the second track, ‘Four Feet From The Door’ (yes, like the album name), as it is a strong display of her style in the piano and how the band behind her follows her willingly with electric guitars almost singing the same notes as the piano, matching perfectly the main idea. It is definitely the piano and her song the magnets that keep all of the other sounds together, but her voice is definitely the protagonist of it all: an amazing modulation of strong and soft notes when required, a beautiful color that would feel dark, reminding me of the intonation of paroxytone verses. This sensation is fully captured through ‘The Train’, which is incidentally the penultimate track of this EP and the one I consider as the core of the EP. There’s a quite colorful contrast between the penultimate and last sounds of this, as ‘My Brand New Boy’ offers a snappy melody and almost ska riffs to then change to a light blues, proving again the vocal skills of this talented girl. It’s not like everyone can shift from genre to genre and adapt their voices to such that easily and survive successfully to the transition. Not everyone can become a magnet like See Emily Play and be the owner of a gravitational force that attracts relentlessly all of the other sounds participating in a song. It’s an honest passion that slowly covers your mind and travels to your heart, and this is so strong that it interrupts your thoughts and instead makes you think of their universe. See Emily Play Website. Myspace. Facebook. Reverbnation. Twitter. Soundcloud. Posted in reviewsTagged Four feet from the door, Rock, See Emily PlayBookmark the permalink.